High Pressure Water Jetting by Kent's Best! Working throughout Kent and London, we utilise the very best high pressure water jetting systems to make light work of clearing out drain blockages and scale at homes and commercial properties across the South East. Our high pressure water jetting service is an ideal way to clear out drain blockages and scale, and also to clear up pollution spills, property guttering, roofs and even garden decking and patios. We utilise high pressure water jetting regularly in our work; an ideal way to clean out many blocked drains or to maintain pipework with de-scaling and periodic cleaning, the high pressure jet can be used flexibly to clean almost any surface with really ground in, difficult to shift, dirt. From domestic garden patios and decking to clearing up grassy areas around reservoirs and lakes after a pollution control problem, high pressure water jetting is a fast and effective way to get things clean again. For first class, professional and effective high pressure water jetting, call Kent and London's experts at JLH Drains. Call us now on 0800 781 8922 and we'll arrange your free survey and no obligation quotation at your convenience. We offer one off services, 24/7 emergency call outs to fix drainage system problems and also ongoing maintenance contracts especially for commercial drains needing cleaning on a regular basis. Ideal for keeping the drains clean and operational at restaurants, hotels, garages and building sites we also regularly work for property management companies and letting agents across Maidstone, Ramsgate, Margate, Bexley, Rochester, London, Orpington, Faversham, West Malling, Sevenoaks, Medway, Sheerness and Gravesend. With over a decade of experience and £5m liability insurance we take our safety and compliance responsibilities seriously ensuring our team are fully certified to do the work they do. Accreditations include confined spaces and breathing apparatus work, CSCS cards for building sites and water works health and safety, streetworks clearance for signs, lighting and guarding. Based in Gillingham, in Medway and four other sites across the South East, we specialise in providing high pressure water jetting services to homeowners and commercial clients across Kent, Sussex, Surrey and London. We have recently undertaken commercial and domestic drains projects for customers in Rainham, Rochester, Strood, Gillingham, Chatham, Sevenoaks, Maidstone, Dartford, Gravesend, Meopham, Orpington, Bexley, Sittingbourne, Sheerness, Whitstable, Sheppey, Faversham, Dover, Margate and Ramsgate. 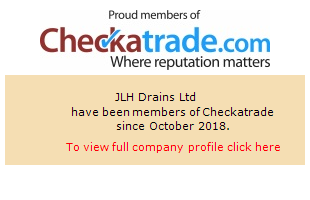 Whatever your requirements for quick and effective cleaning of any surface using a high pressure water jet speak to the certified experts at JLH Drains; contact us today and we can arrange a no obligation survey and quotation with one of our specialist team. Working throughout Kent, Medway, London, Surrey and Sussex, we specialise in fast, affordable and highly effective domestic drain repairs services. If you've got splits and cracks in your pipework, then drain relining could provide the mess free and affordable solution. Call us today to find out more.